As SQL Server Analysis Services Tabular Models become more popular, models will use Oracle databases as sources. One of the key issues whenever you work with Oracle is understanding how to properly configure the necessary components to enable development. If you have worked with Oracle before, you are very aware of a few things you need to be successful. First, you need to install the Oracle client. Here is where the details get messy. When you are working with MSBI tools, you will be using SQL Server Data Tools in Visual Studio which is still only 32 bit. Of the BI tools in SSDT, only SSIS has run modes to support 32 bit and 64 bit configurations. 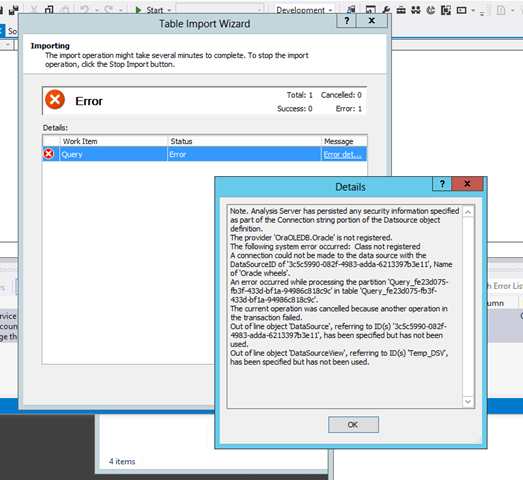 As a result, you need to install the 32 bit Oracle client in order to develop your tabular model. NOTE: It took me many hours to work through a variety of configuration issues related to working with the Oracle client install. A couple of reinstalls, reboots, TNSNames.ORA tweaks, and lots of fruitless searching were all required to get this working. Be warned, working with Oracle clients are neither fun nor simple. 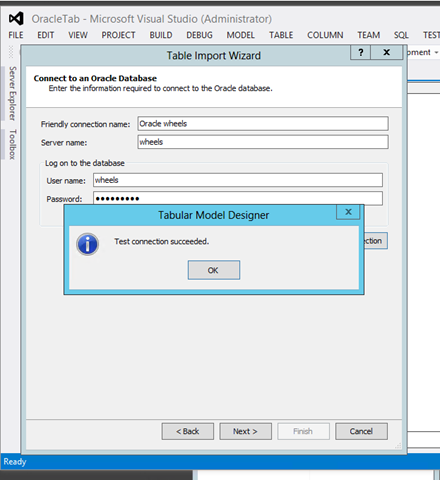 Now that you have the 32 bit client installed you can connect to the Oracle database through the tabular model designer. 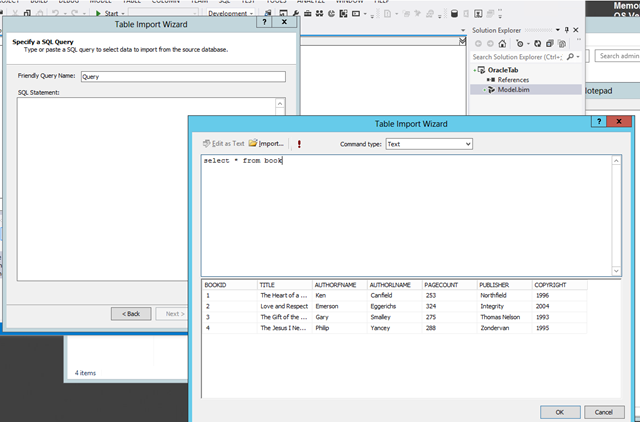 As shown below, you can connect to Oracle through the Table Import Wizard. You will be able to successfully test the connection as noted here. And you will be able to execute a query and get results. You can also use the option to select tables and views. The issue is that while you can do most of your work within Visual Studio using the 32 bit client, the import process targets the SQL Server tabular instance you specified when you created the project. While the 32 bit version of SQL Server is still available, most of us would not install that, even in our development environments. If you do not encounter this error, you are either using the 32 bit client of SQL Server or you have the 64 bit Oracle client installed (more on that next). As long as Visual Studio is only 32 bit compliant and you choose to use the 64 version of SQL Server you will see this issue. The resolution is fairly simple. You need to download and install the 64 bit Oracle client. I would recommend that you get it installed, then reboot your development PC. While this may not be required, it seems to have helped me with a number of connectivity issues. You will need to be prepared for some “interesting” issues as you will have more than one Oracle home installed and you have the potential of many types of ORA-XXXXX errors. 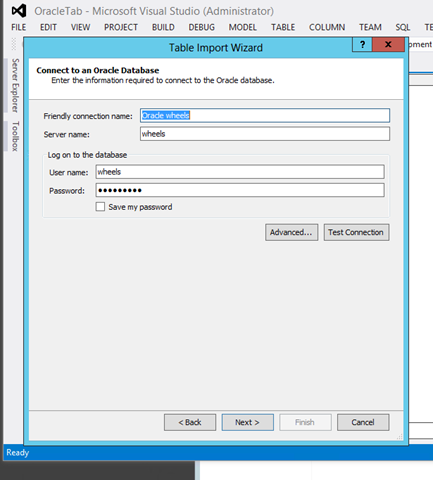 Once you are up and running you should be able to develop tabular models built on Oracle databases. First, I want to be clear that I think that Oracle is a solid database platform. However, I have never been at a client site or on a project where the connectivity or client installs were totally correct or functional without some work between the Oracle team and the BI development team. I think that the .NET driver is supposed to better and I may try that out for a later post (when I have the hours to spare). I did the testing for this completely on Azure (and my Surface). I set up an Oracle VM and a SQL Server VM on Azure. The Microsoft team put together a great reference on setting up your Oracle VM. Check it out. I also did a previous post on setting up Oracle in an Azure VM. Both VM types can be pricey, but in a testing environment all was not too bad. I encourage you to use Azure to for these types of scenarios. But be sure to turn it off when you are done.